As more and more dragons fall to this mysterious illness, a new horror is rising! Any dragons slain by the disease return to unlife…as zombies! 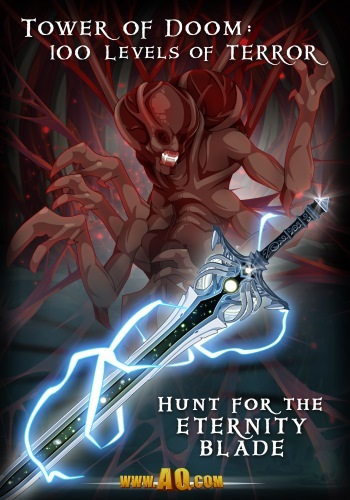 Work with Artix and Galanoth to find a cure for those affected by the zombie plague, then partner with Warlic to hunt down the disease’s source, because what he’s learned spells destruction for the purity of elemental dragon magic… EVERYWHERE! 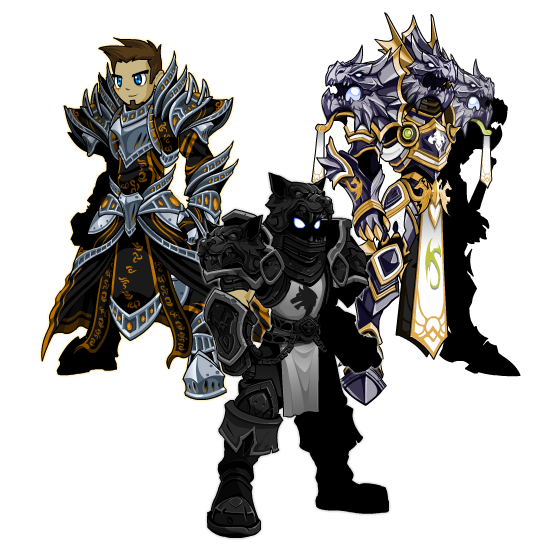 Artix, Galanoth, and Warlic, OH MY! Dragons are dying in Etherstorm... and the ones who haven't been returned to the DragonPlane for purification are rising again as zombies! That's not the worst of it - others have disappeared completely! But in the chaos caused by the infections and quarantines, no one has noticed. This is a very VERY bad thing! 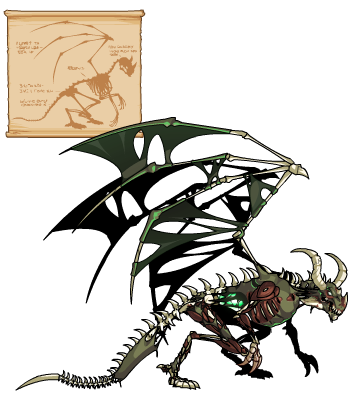 But before you can investigate THAT, you're going to have to travel around Lore with Artix, Galanoth, and Warlic to seek out the cause of the plague... and if Warlic is right, we are ALL going to be DOOMED! More LQS Previews are Here! 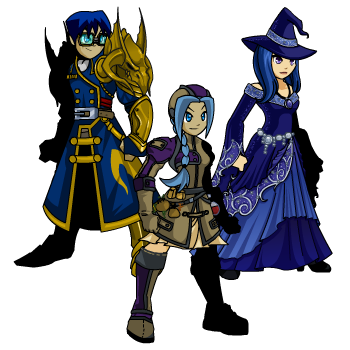 The first-ever Limited Quantity Sets arrive in AQWorlds this Friday night... and earlier today we released previews of more LQS gear! Read the Design Notes to see all the prices, timetables, and quantities! Sets Go Rare This Friday, May 9th! The first-ever Limited Quantity Sets are almost all gone - only one set remains! Check out the Lavastorm Lord Limited Quantity Set on the LQS webpage HERE, but do not wait too long, because it will only be available for a few more days! 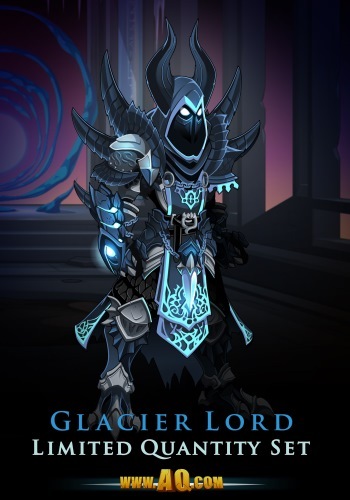 The Glacier Lord is a pretty cool guy. When and Where to Get the Gear. Not sure what time the shop opens or restocks? Use this timezone converter to find out what time it is in YOUR area! Note 1: Based on player feedback and overwhelming demand, both May 5th restocks will take place as scheduled. Note 2: The restock amount will always be added to the previous amount of gear. Gear not sold before a restock will remain in the shop. 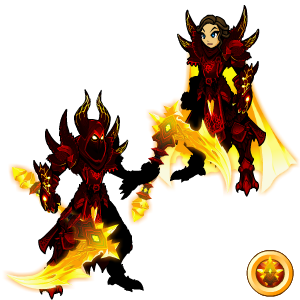 * A Dark version of this set will be available in next week's Rare shop. Limited Quantity Sets will work VERY differently from the way Limited Quantity Shops did in the past, though the core idea - a limited quantity of gear - will remain the same. Actual prices and quantities are listed above. Check the Design Notes, hompage, and upgrade page for the webpage where you can buy the sets! You'll also be able to log into AQW and talk to Khuddar Khamundi, the Black Market Vendor, will return to Battleon with a link to the webpage. 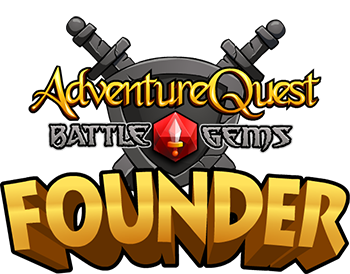 Be the first to play Battle Gems for the Android: the 1st major mobile game created by the same friendly (and crazy) team that creates AdventureQuest Worlds. Battle Gems is available right now for free on Google Play's App Store for your Android device! 150+ monsters including BrutalCorn, Octobear and more! 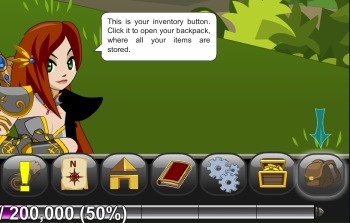 Every item you collect increases your total power! Limited Time Offer: Become a Founder! Battle Gems is already getting GREAT REVIEWS! Thank you so much to everyone giving the game five stars to us on the app store. Battle Gems has been getting amazing feedback and reviews -- check out this KILLER game review from the game review site, Game Skinny! The humor is spot-on perfect "AE" and Battle Gems has the highest quality and most consistant art. I am really proud of the team, the testers, and our online community for all of the long and hard work that went into creating this amazing game. Thank you guys!!! We are working hard on the Facebook version now! Even if you cannot play yet, please help us spread the word! Do not forge to LIKE the BattleGems Facebook page! If you're a fan of EpicDuel, then you already know what about Limited Quantity Shops. Some people love them, some people (the ones who forget to set their alarms) hate them, but they give those who like collecting rare gear a chance to grab (and display) a shining trophy that only a select few will possess! Test page: actual prices/quantities not shown. Amounts will restock throughout the weekend (look for a schedule tomorrow or Wednesday) so that everyone gets a fair chance at the gear. (That means we will only release a fraction of the total amount at first. )* The numbers in the picture above are NOT final. * Example: if we have 20000 free player gold sets, 5000 would release Friday morning, 5000 Friday night, 5000 Saturday morning, and 5000 Saturday night. Will the Sets Be Legend, Free Player, or AC? 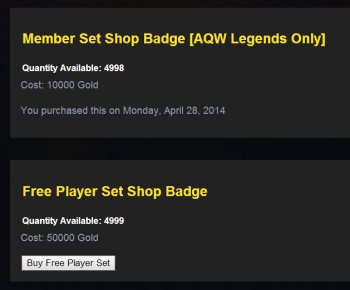 You can buy the Legend-only and free-player gear with gold on the webpage, but inside the shop it will be 0 AC for free storage! Will There Be Enough Items For Everyone? No, but with the multiple restocks, your chances of getting an item are now much better! The number of items will vary depending on the item (the lowest quantity items being the most rare). We are looking into some of our other Limited Time Items, AC items and Seasonal Rares, seeing how many were purchased, balancing that against server traffic at the time and coming up with what we believe to be a reasonable quantity for the LQS items in most cases. No, but if you purchase an item from the shop or revisit the page, you will see the updated amounts. If you see only a few left, click quickly... the LQS might already be sold out! You see the updated amount after you purchase. When Will The First LQS Be Launched? This Friday at 6:30 PM Server Time (Eastern Standard Time or GMT -5) Khuddar Khamundi, the Black Market Vendor, will return to Battleon with a link to the webpage. The URL will also be posted in the Design Notes, on the homepage, and on the upgrade page. This week's Etherstorm release might arrive before or after that. I Thought LQS's Were Never Returning? First off, thank you for staying with us since we made that announcement in 2012! We did not think they ever would, either**. But as we made server improvements and brainstormed ways to solve the biggest issues you guys had with the idea, we wanted to try again... with a twist. The quantites will restock multiple times, so no "timezone favoritism"
** The leftover gear from previous Limited Quantity Shops will not return. New system, new gear. Tonight: return to Etherstorm to save the dragons! Darkness has fallen over Etherstorm. The elemental dragons are dying mysteriously, and no magic is able to save them! Search through the homecity of the Elemental Dragons to discover where this plague came from and how it infects them. The Deadliest Plague the Dragons have ever seen! Time is running out, and as the dragons die one by one, so does Lore’s future! Make sure you've finished the Desoloth the Final storyline that begins in /firestorm, then hurry to /join dragonhame. Once you're there, work with Drakor and the townspeople of Dragonhame to discover who - or what - is killing them before dragons outside of Etherstorm are infected, too! Defend Dragonhame while Warlic is away! 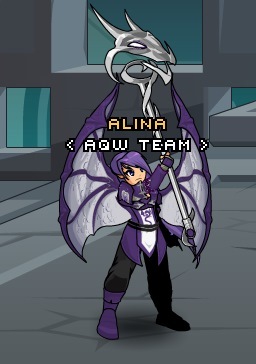 Coming tonight, talk to Aniya in Dragonhame to get your own DragonFlight's Reach blade for 1000 AdventureCoins from her weapon shop for a limited time. Within this blade dwells the spirit of an ancient dragonmaster... wield it well to save the dragons of Etherstorm! The sword will evolve as the Dragon's Plague story continues. Next week: horns! 3rd week: OMG Dragon Buff! You can also find a TON of new gear (and your old favorites from the original storyline) in the Dragonhame shops! Run around town to meet the townspeople and find out about life serving dragons! New Wheel of Doom Drops and Merge Shop Gear! Find the Dark Exosuit Binsuko set in the Wheel of Doom and Destiny merge shops! This set will be around for several months, so you've got time to save up the Fortune Potions to get it! The armor costs 150 Fortune Potions, but because Legends get a free spin on the Wheel EVERY DAY, hundreds of Legendary Heroes already have the gear! The entire set will be around for several months, so if you don't have enought potions NOW, you can save up for them! The 1% drops in the Wheels of Doom and Destiny will change out NEXT Friday, so now's your last chance to get them for many months (they will return early next year)! The "Design an AQW Release" contest has begun! AQW is looking for more Artists and in-game Moderators! If you have Snowball Amberarms, the pet from Zoshi's birthday, you can now accept his quest by talking to Zoshi in the Tower of Doom! 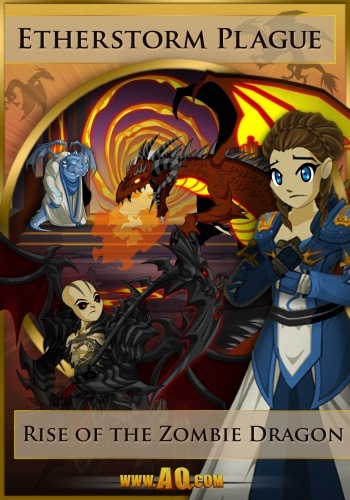 "Become an AQW NPC" and "Design an AQW release" contests are live! The Summer of Chaos: 13 Lords of Chaos Saga Finale begins June 6th! Every dravix, dravir, human, and dragon gathered on the plains outside Dragonhame. It was always a grand day when a young dragon was ready to take its first flight alone. Once the dragonling landed safely, the celebrations would begin and go on for days. The first rite of passage would be over, and the dragonling would begin learning the magics unique to its element. The exhilaration and rush of joy a dragonling feels on its first solo flight is something they never forget. It is a day they will remember for the rest of their lives. Go UP UP UP! Gotta FLY! Love it love it love it Big dragon is ME!!! Oh oh. I... dizzy. Head spins. Falling too fast where is momma? Momma? *whimper* I falling need catch! As the crowd below watched, An'Desi climbed higher and higher, growing smaller against the vast expanse of sky. They townspeople laughed and cheered, congratulating An'Desi's teachers and kin... Until one young Dravir shouted, pointing skyward. Silence fell as the crowd watched An'Desi begin to descend. It was too soon for him to return. As he fell faster, the dragons on the plain launched themselves into the air, straining to gain enough altitude to slow the fledgling's fall. The crowd dispersed quickly, shocked into near-silence, save for the murmurs of fear and sadness. The healers crowded around, staring at the once-healthy dragonling. His scales were dull, and a rotten stench rose from his wings. The healers gazed at each other in fear. In a whisper, Ll'Lara, Dragonhame's Master Healer, announced the diagnosis: "... Plague has come to Dragonhame." With school and work having stolen much of our artists' time, we are looking for a few great AQW fans to become volunteer assistant developers, and hopefully, if things work out in the future, full time staff members of AE. Find more details on THIS PAGE! We have always said that we make these games for and WITH you... and that's why so many of our team members began as regular players*! Now we need some of you to join Reens, Sora, and Stratos' in-game moderation team to make AQWorlds a safer, funner** game for everyone! Reens, Sora, and Stratos want YOU to join the mod crew! Hi guys! Stratos, Sora, and I are looking for new mods for AQWorlds (and HeroSmash), and now is your chance to apply! One thing I have to stress - you MUST be over 18. If you are under 18, if you don't include your age, or if you start with "I'm not 18 yet, but..." the application will not be considered. 13 Lords of Chaos Saga Finale Begins June 6th! When you first arrive in the Land of Lore, you're hit by lightning and fall down a mountain. This is a sign that YOU are no ordinary Hero! You're strong, can withstand things that would kill an ordinary person and, beyond that, have been chosen by Fate for an extraordinary journey! 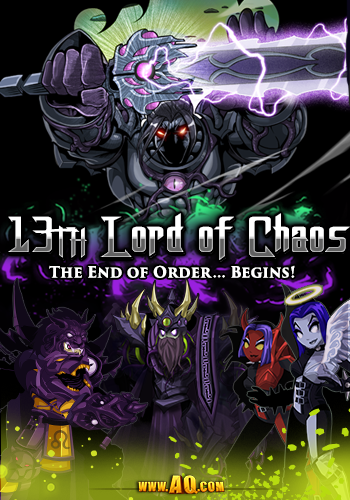 Artix has planned the end of the 13 Lords of Chaos storyline for YEARS... and the finale is about to begin! Over the coming weeks, the AQW team will be focusing on building the Chaos Saga finale, because once the sun sets on June 6th, CHAOS will erupt and the world as you know it... will be gone! Prepare yourselves, heroes, because this summer you're not going to be fighting for your life... you'll be battling to save the world! June 6th: 13th Lord of Chaos Saga Finale BEGINS! Confront Drakath and discover the identity of the 13th Lord of Chaos. It's time to save the world, and it's all up to YOU! June 13 - 27th: 13th Lord of Chaos attacks! How will YOU fight back? Live wars each day, story events every Friday! 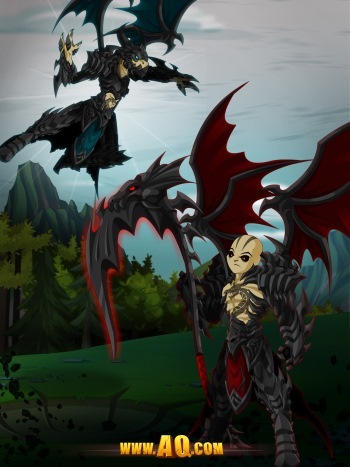 July 11th: Drakath waits for you, Hero... Will you be ready?! The answer is YES!!!!!! In the weeks leading up to the Summer of Chaos, we'll be focusing a LOT of our development time and energy on making this summer the BEST MOST CHAOTIC EVER! Check out what we've got planned for the month of May to keep your battle skills honed while we prepare! May 30th: "Calm Before the Storm" pre-Chaos AQW Cleanup! Stop the Deadly Plague Killing Etherstorm's Dragons! Darkness has fallen over Etherstorm. The elemental dragons are dying mysteriously, and no magic is able to save them! 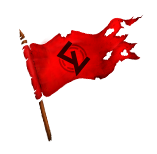 Search through the homecity of the Elemental Dragons to discover where this plague came from and how it infects them. Time is running out, and as the dragons die one by one, so does Lore’s future! Work with Warlic and Galanoth to discover who - or what - is killing them before dragons outside of Etherstorm are infected, or all of the dragons of Lore may die out… forever! Here there be dead dragons! Tuesday: "Design an AQW Release" Contest! Look for Beleen's DNs on the new contest tomorrow! 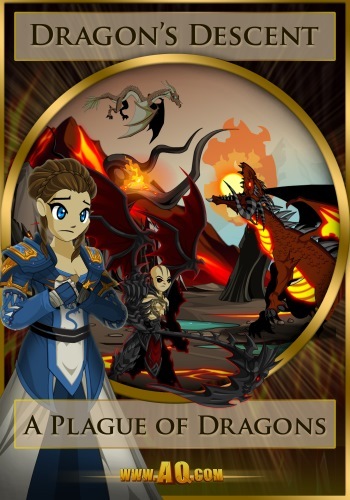 This is YOUR chance to design an AQWorlds release! You (and any friends you work with) will have your ideas turned into a release for ALL our players to enjoy! You'll also be featured in the Design Notes and Facebook, get some extra ACs, and know that you had a huge hand in building AQW! Deep in the forests near Doomwood, you'll find the Carnival of Fortune, a place of magic, mystery, mayhem... and luck! Spin the Wheel of Doom or the Wheel of Destiny for a chance to win exclusive prizes, Potions, gold, and a chance for the Ultimate Item of Donated Awesomeness! Not sure how this all works? Check out our Wheel of Doom FAQ! How to get to the Wheel of Doom/Destiny? What do I get when I spin? You can use the Fortune Potions and the XP Boosts you receive in the Wheel of Doom and Destiny merge shops to create exclusive gear! You may also win one of the bonus prizes that also drop from the Wheels! With every spin, you get a chance to get a rare 1% drop - either the Ultimate Item of Donated Awesomeness OR a hard-to-get item OR gear that ONLY drops from the Wheel of Doom! The gear listed below will be leaving the Wheel of Doom NEXT WEEK... while the gear replacing it will become available for a while. Before the items listed below leave, their drop rate will increase to let anyone still hunting have one final shot at getting the gear! The MechaJouster Armor is ONLY available from the Wheels! * This Design Notes was originally posted on April 21st, but has been updated. Why is the Gear Changing? Good question! 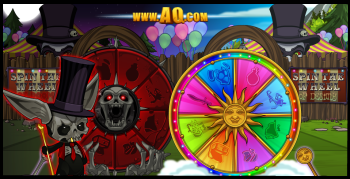 Back when we first introduced the Wheel of Doom, we added in old Quibble items that were NOT tagged rare (we will never return an item that has been tagged rare!) and gave them a 1% drop rate. MANY of you guys were very, very happy about that, but a lot of you had reservations. As a compromise, we said we would swap out the 1% items every couple of months so... and that time has come. There are only a handful of Quibble items without rare tags left, which means there are only a small number of them that qualify for inclusion in the WoD. So, we are adding some of those items back in, but with some additional recolors for the merge shop. We were going to stop cycling the items in and out, but based on player feedback, we decided not to do that. There will still be a small increase in the drop rates, however, before this latest batch leaves next week. Get Double EXP on ALL SERVERS All Weekend Long! Sunday: NEW Grenwog Boss Drops! This Sunday, celebrate Spring by battling the Grenwog boss when you /join Grenwog! He'll drop the Legend-only Eternal Egg pet AND the Grenwog Dyes Blade for all players! The Spring egg hunt, Grenwog map, and rare gear leave next Friday! The First of Three Fantasy Hero Sets! Starting tonight at 12:01 AM, unlock all 11 items in the Wolfhound Warrior set with the 12 month upgrade package or choose from the 6 month upgrade, 3 month upgrade, 5000 AdventureCoin, or 12000 AdventureCoin packages for selected items from the set! 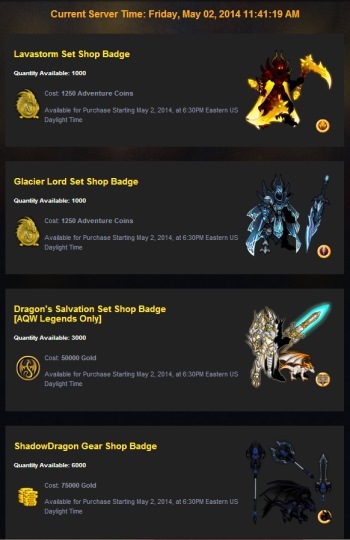 And because the Timedragon Warrior Package is ALSO running, when you buy a 3, 6, or 12 month upgrade or either the 5000 or 12000 AdventureCoin packages, you will ALSO get those items, too! In Lore, one thing is always true: When you play the game of Chaos, you win or you die. There is no middle ground. But we choose to defy fate, and know you will want to, as well! The Wolfhound Warrior is the first of three new tiered sets paying homage to the Game of Thrones book and television series. 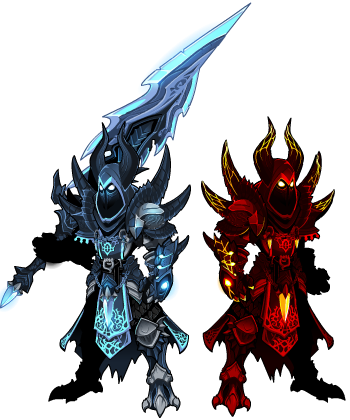 In the coming months, the Dragon Emperor and Dark Warlock sets will follow, too. Unlock all 11 items in the Wolfhound Warrior set with the 12 month upgrade package starting this Friday, April 18th, at 12:01 AM server time, or choose from the 6 month upgrade, 3 month upgrade, 5000 AdventureCoin, or 12000 AdventureCoin packages for selected items from the set! It is known as the Tower of Doom. It grew from the ground over the course of a hundred years, a dark, twisting spire of rancid flesh that reached 50 stories into the sky. At first it was merely a curiously which cast a shadow over the land (and a widening blanket of morbid odors). But soon it was apparent that the Tower was poisoning the land around it. Brave axe-wielders were sent to dismantle the Tower, but for every gash they rendered upon its surface, another layer of fetid matter grew to heal it. An opening was discovered in the Tower at ground level, and it was decided that it may need to be destroyed from the inside out. Many warriors and mages entered, and found the bowels of the Tower to contain vast collections of the world's most terrible beasts. The Tower defended itself by raising its own army within it, and rarely did an adventurer escape with their life. At last there arrived the legendary knight Sir Tendeth, whose expoits included defeating three dracoliches at once and saving one of King Alteon's daughters from a band of cannibalistic highwaymen. He was the most admired fighter in the realm at the time, and if anyone could make their way to the top of the Tower and find its source of power, it was Sir Tendeth. He carried with him the fabled Eternity Blade, an ancient sword said to be forged using the metal from the heart of a falling star. With this blade, Sir Tendeth chopped, sliced, and gashed his way to the top of the Tower of Doom, with his Moglin squire Ingvald following close behind. But at the top of the Tower, Sir Tendeth discovered a terrifying creature that called itself Creel. The honorable knight fought bravely, but succumbed to Creel's attacks, and the Eternity Blade was lost in the bowels of the Tower. Only Ingvald made it out alive, a shuddering, blubbering mess. All he could say at first was, "The Tower is Creel, and Creel is the Tower!". The Tower of Doom extends 50 stories up, and 50 stories below the ground. Somewhere within, the Eternity Blade waits to be found. And the at the top of the Tower, Creel awaits his... or her... or its next victim. Conquer the 100 Levels of the Tower of Doom! Unlock ALL the Fantasy Hero Gear With One Pass! In Lore, one thing is always true: When you play the game of Chaos, you win or you die. Everyone on the AQW team is a HUGE Game of Thrones fan, and we know so many of you are, too! That's why we asked two of our best artists, Dage and Tyronius, to make the three Fantasy Hero sets as a way to pay homage to the Game of Thrones book and television series. Turn your fantasy into reality with the Fantasy Heroes Package Pass! Get everything listed below for only $59.95—a value of $180.00! You can find the Fantasy Hero pass in the "Special Offers" section on the upgrade page or on the Portal site. Then head in-game and open your Book of Lore! Find the "Fantasy Hero Badge and open to shop to get all the gear! In Lore, one thing is always true: When you play the game of Chaos, you win or you die. There is no middle ground. But we choose to defy fate, and know you will want to, as well! Starting this Friday, April 18th, at 12:01 AM server time, Unlock the Wolfhound Warrior gear with select upgrade and AC pacakges! The Wolfhound Warrior is the first of three new tiered sets paying homage to the Game of Thrones book and television series. 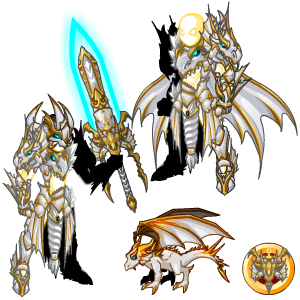 And because the Timedragon Warrior Package is ALSO running, when you buy a 3, 6, or 12 month upgrade or either the 5000 or 12000 AdventureCoin packages, you will ALSO get those items, too! 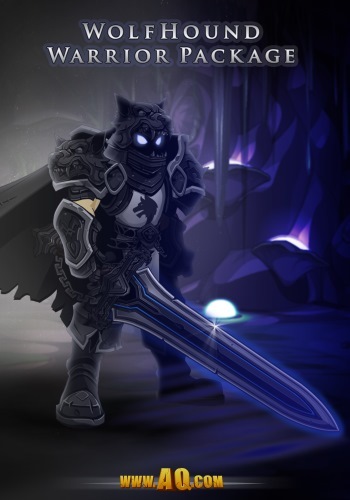 Unlock the Wolfhound Warrior gear when you upgrade or buy AdventureCoins! Why Become a Wolfhound Warrior? When you choose one of the Wolfhound Warrior tiers, you're supporting AQWorlds directly, and letting us continue to create new releases, write more storylines, and making sure anyone who wants to can join in the battles alongside you! 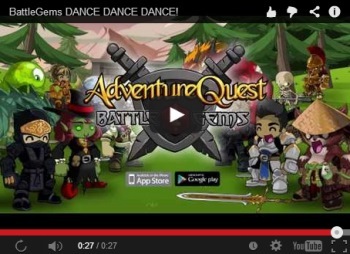 1,5000 bonus AdventureCoins will also be awarded at the end of June to ANYONE who buys the Fantasy Hero Pass! This is One Tall Tale! Sorry to have missed the last few throwbacks everyone, between New York City for choir and bronchitis, I’ve had my hands pretty full. 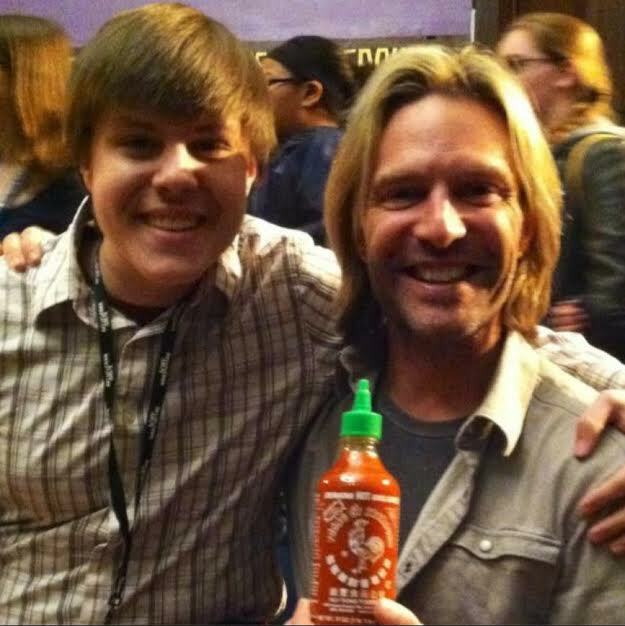 Sidenote: When going to NYC to sing with your favorite composer, always stalk his twitter for his favorite hot sauce. ALWAYS. It’s story time! 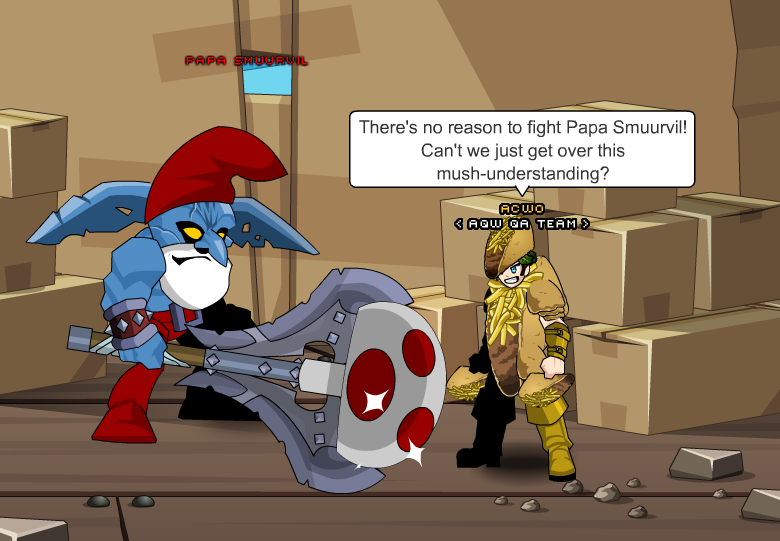 Besides monster slaying and quest looting, finding time to entertain BattleOn’s youth with daring stories of past adventures is still a priority. 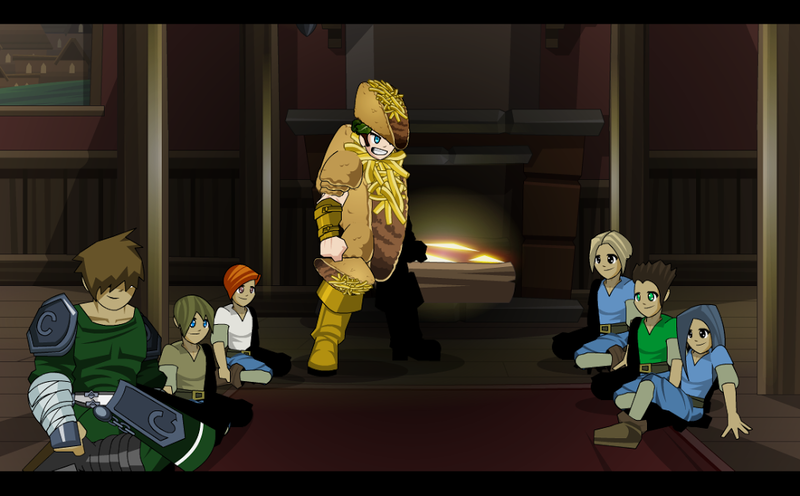 If you haven’t already, check in with Yulgar over at his Inn and click Giant’s Tale to begin your biggest retelling yet! Living as a bean farmer on the outskirts of town, Jack never had the easy life, especially with this year’s bean crop producing only a few handfuls. A stranger sensing Jack’s troubles, decided to take pity on him and trade his lowly crop for not just a regular Chickencow, but a MAGICAL CHICKENCOW! Has Cy been sitting there the whole time? Who knows, but either way he’s here now to interrupt your wicked storytelling whenever possible. After attempting to calm Cysero, you tell the children how Jack decided to well... um… plant the Chickencow in his field? Never said Jack was a normal child. Following fairytale fable, isn’t this the point where the magic beanstalk should appear. NOPE! I hope a spotted ladder rising from the grounds rungs a bell, because that’s definitely what happened. This ladder didn’t just steal the show, it stole the whole town! Turns out the giant really likes his own personal entourage, especially when that group is no bigger than his fist. Make your way through a lawn bigger than a forest in order to rescue the stolen citizens and right Jack’s wrongs. Watch out though, after you claw your up to the townsfolk holding cell, your cage guard encounter will be far from purr-fect. Beating up the giant’s cat is looking in the wrong neck of the woods for the key to the cage. Turns out that the true location is where else, but resting around the giant’s neck! How does one take on the gigantic task of key stealing? Why by a visit to smuurvilest village around of course! It’s funny though, turns out the Smuurvilans don’t like it when you slap them black and blue for their potion ingredients, so be careful when gathering regents, as these villagers pack a punch! After only a mild brawl with the citizens of Smuurvil, it looks like you have all the ingredients necessary for mixing. Finally an easy task, all you have to do is scuttle your way to the giant’s soup across the dinner table. Sorry hero, but swat that idea out of easy out of your head! 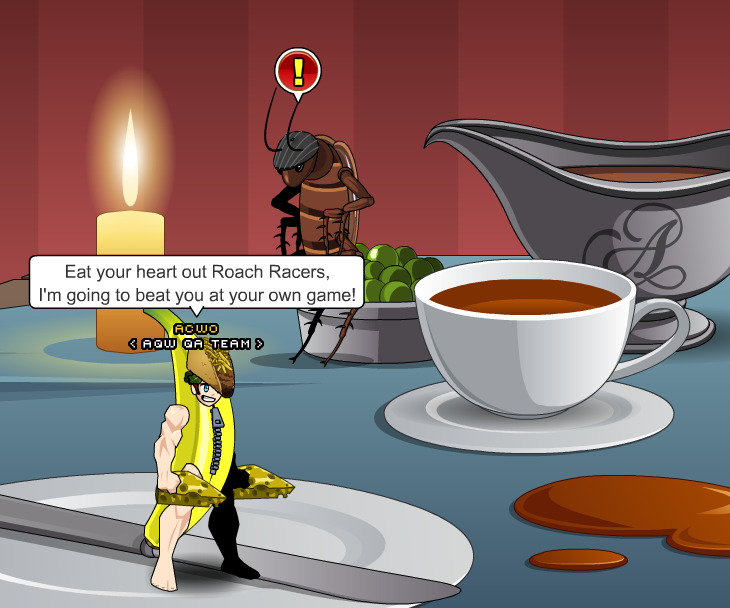 There’s another gang that rules this dinner table, and the Roach Racers mean business. Don’t bug the Racing Roaches Gang for safe the passage though, the only way across this table is though a crazy-crafted kart race! If you can beat the bugs at their own game, it’s time for a stealthy soup drop off. If all goes correctly, a giant sized soup faceplant and key are in your sights. SPLASH! That sounded like a soup bowl to the face, but wait, WHERE’S THE KEY? The real master of the house has revealed himself, get ready for the fight to save the town and yourself! Don’t stop now hero, the key is within your sights! Who know’s what will happen when the dust clears, but I guarantee it won’t be something you’d suspect! Who Needs a Golden Harp? What’s any giant house raid without equally giant rewards? Beyond monster drops that make a golden goose go green with envy, you have an entire roach rubbish pile to raid. Happy reward rummaging! The hardest part of these posts is condensing such an amazing storyline into only a few paragraphs. Reading a release may be fun, but is nothing like playing it, so get out there heros and good luck conquering or reconquering the Giant’s Domain! As always post on the forums or tweet me @ACWOAE with comments or ideas for the next Throwback! Prepare to take your Guild to the next level! 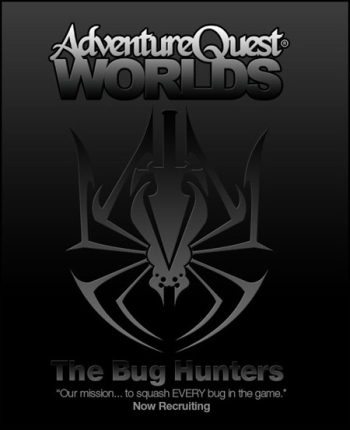 I have exciting news to report: Guild Launch has just launched inside AdventureQuest Worlds! You can log in now and speak with Elise in Battleon Town (north of Battleon, by the Guardian Tower) to begin your Guild Launch adventures. 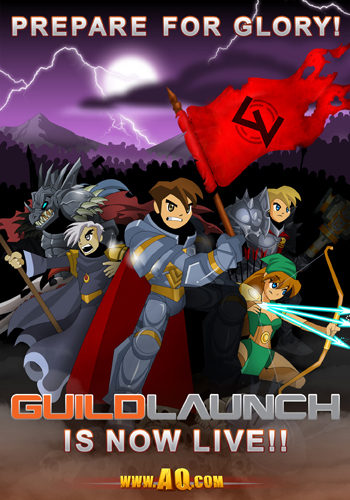 Imagine if Paladins, Elves, Wizards, and Dragons ruled Facebook… the end result would be Guild Launch! 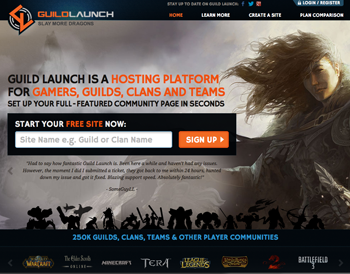 Guild Launch is an epic social networking and website hosting tool that will take you and your Guild to the next level. Guild Launch lets you connect with your Guildmates in the real world, and offers new ways to come together & battle harder in game. With Guild Launch, you can create and customize your own Guild forum, set challenges and achievements, chat across AQW servers, enable voice chat, and more (translation: endless possibilities here, folks). If you are the Guild Leader of your AQW Guild, it’s up to you to create your very own Guild Launch Hub to make communicating, recruiting, expanding, sharing adventures, and battling with your Guildmates easier than ever before. Here's an AWESOME example of the Tercessuinotlim Guild page! Spoiler Alert: in the near future, AQWorlds and Guild Launch will be showcasing the BEST Guilds (major shout outs to you and your Guildmates), hosting our 1st ever Guild Contest, and releasing exclusive Guild Launch quests and item rewards. So be proactive and create your free Guild Launch account now! Got Guild Launch Bugs, Probelms, or Issues? Never fear, the Bug Tracker is here! We hope that you have a flawless victory with Guild Launch, but should you encounter any problems, please send the AQW team a bug report and we will fix it as soon as we can! 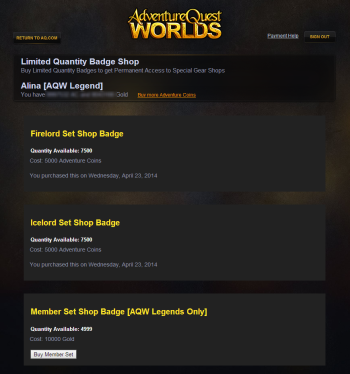 Need some help with your Guild inside AQWorlds? Check out the Guilds Chapter in the Lorepedia here! For now /join guild cities and halls has been removed as we revamp the system and make it all shiny and better. More on that to come. So what are you still doing reading this? 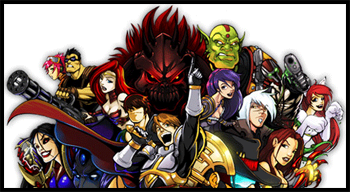 Log in to AQWorlds now and prepare to take your game to the next level with Guild Launch! We have been getting a lot of emails and tweets from players who are maxed out on ACs, have years worth of membership, or simply want to buy the gear that comes with our special packages. In response to that request, we are trying a new package: the special package pass. Buying a special package pass for $60 USD will unlock ALL of the gear from the Wolfhound Warrior AND the other two packages in the series once they are released. Once those packages go live in the near future, anyone who bought the pass would automatically get them in their badge shop in the book of Lore. You would have to buy 3 years worth of membership to get all of this gear with the set-up above, but if you're a gear collector (or just a HUGE Game of Thrones fan, like me... #TeamTyrion) or maxed out on upgrades, then this is going to be the way you want to go. Can you fight your way to the top? Monster Hunter Zoshi has found the mother lode - a giant tower filled with every kind of monster imaginable! This Friday, battle your way to the top - and the bottom! - of this colossal column to prove to the world that you are a champion monster hunter! When you enter the tower, you'll be able to climb your way to the top - or tunnel far into the ground to the bottom - for a pair of ultra-disgusting, high-level boss fights. As you fight your way toward them, you'll encountertons of different monster types, and even old bosses from your past. 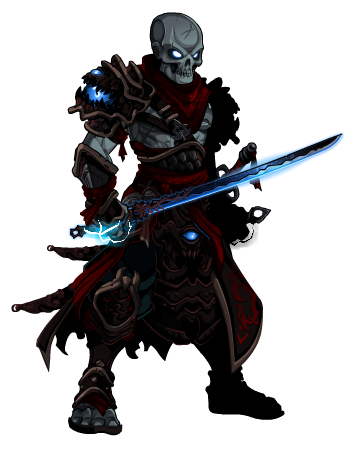 Players level 30 and up will also be able to accept a quest for the fabled Eternity Blade. Anyone who manages to obtain this very special sword will be entered into a really awesome contest - we'll be posting the details about this later! Design notes about the Wolfhound Warrior tiered special package* will be coming tomorrow! We'll also be talking about the new Special Package Pass! * Earlier DNs said this was a Class, but that was an error. It is an armor set with 3 variants. 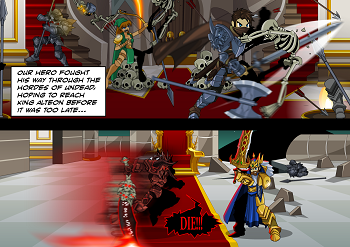 13 Lords of Chaos comic: Alteon Vs Sepulchure! Blade's been hard at work on this comic series and part 2 is done! If you missed part 1 don't worry, you can find it right here! The 13 Lords of Chaos storyline all started with an invasion, so that is where our comic begins! Created by one of AQWorlds' newest - and funniest - artists, Blade will be recreating the 13 Lords of Chaos in comic form one panel at a time! Wish him well, and enjoy! Dark Dracomancer Limited Time Shop! 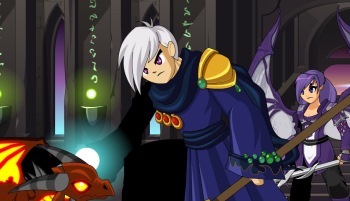 Drakor the Dark Dracomancer* is pushing Quibble out of Battleon this Friday to display his Etherstorm wares. ** He's got a set of draconic morph gear that will make your enemies fear and your friends /cheer! Click on the different armor parts to turn from human warrior into a draconic death-dealer! Weyr do you find it? Battleon! The shop will be available for a week hours... and the countdown begins this tonight! 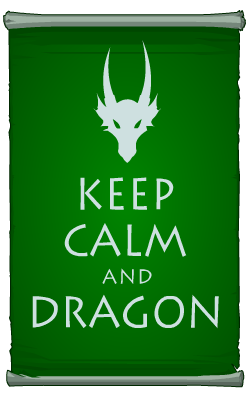 ** You'll be returning to Etherstorm later this month in the Dragon's Descent mini-arc! The quest to create a new and improved tutorial continues! 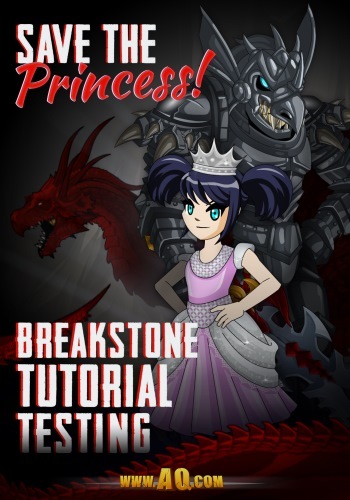 Earlier this week, we released the first version of our new Breakstone tutorial for you guys so we could hear your thoughts. We need you to help us make the tutorial as easy to understand, helpful, and engaging for new players as possible! Thank you for helping us test! That is not all of the changes you suggested that we are going to make, though! We've got a running list, and we will keep adding improvements. One of the best pieces of feedback we received over the last couple days was that you REALLY want knew players to learn how to chat, use the interface, and learn how to report people breaking the rules. We agree! Do you like these tutorial cutscenes? Would you like to see us do more? If so, let us know! These cutscenes will also be added to Battleon AND in the Book of Lore, as well. We REALLY appreciate that you guys are helping us test... but we know that most of you are higher than level 3-6. That's why we added high level versions of the Dread Dragon. If you are a high-enough level, you'll see a button to take you to level 30, 45, or 60 versions of the boss. 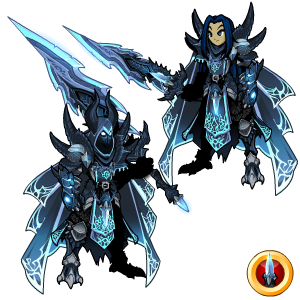 Each version drops exclusive items: the Mystical or Warriors' Beast Master armor and helms!